“When I’m here I get to see the world as it should be.” That is Ralph Pileggi’s perspective about Our Lady Star of the Sea School (OLSS) in Atlantic City, where he has worked for 24 years. A seventh grade teacher, Pileggi celebrates the diverse community that draws families from several countries of origin. “I love it. I get to learn a lot in the classroom with so many different nationalities,” he said. First grade teacher Mimi Lovallo agrees. “The students have a lot to share about their families and things they do at home,” she said. At Saint of Padua, Camden one of the Catholic Partnership Schools, and above at Our Lady Star of the Sea School in Atlantic City. Latino students account for more than a third of OLSS’ enrollment. The school has a significant Asian population as well. 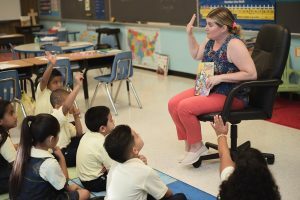 In Vineland, more than 50 percent of students at Bishop Schad are from Latino families — a reflection of the rapid growth in the U.S. Latino population. The U.S. Census Bureau predicts that Latinos will comprise 30 percent of the United States total population by 2050. Since most Latinos are Catholic, the growth in the church among Latinos is higher than any other demographic group. According to the USCCB, 8 million school age Latino children live in the United States, yet just 4 percent are enrolled in Catholic schools. 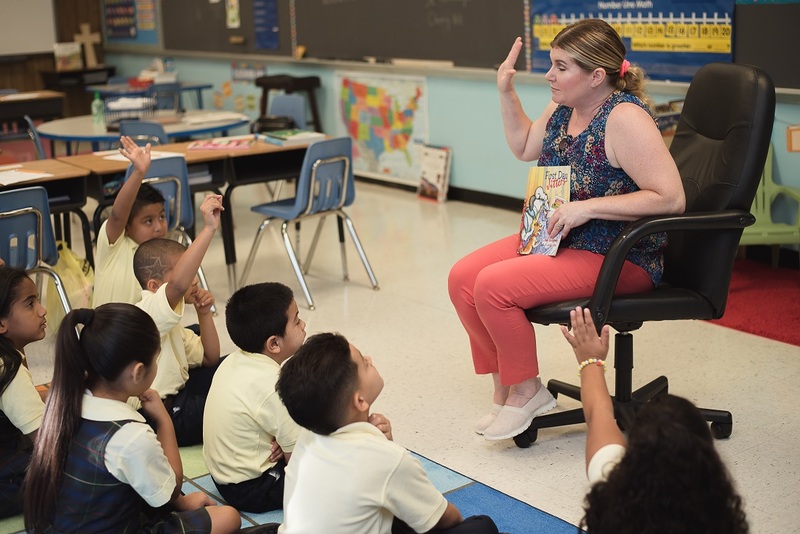 Across the country, Catholic schools have realized the need to attract more Latino families who seek an education that merges faith and academics. Since 2014, the Diocese of Camden has made a concerted effort to reach out to Latino families. That effort has resulted in an increase in Latino enrollment — from 4 percent to 6 percent of students enrolled in diocesan high schools, and from 12 percent to 18 percent of students enrolled in South Jersey Catholic elementary schools — well above the national average. In the five Catholic Partnership Schools, those numbers are even higher, reflecting the demographics in and near the city of Camden. As demographics continue to change outside the city, the enrollment shift is opening up new academic, cultural and faith opportunities for entire school communities. Our Lady Star of the Sea is making groundbreaking gains with differentiated learning. Class may start with a mini group lesson, and then students break into small groups and rotate through various learning stations — online, in small groups, working independently and meeting with their teacher. Cheryl DeVecchis at Saint Michael the Archangel in Clayton sees the same kindness in her kindergarteners. “The kids are so loving … so welcoming,” she said, adding that students watch out for their two new Latino classmates. “If a [Latino student] doesn’t have the right color crayon out, [classmates] will go in the pouch and pull the right color out,” she said. DeVecchis said the difference in her Latino students’ language skills is “night and day” since they arrived at the start of the school year. Students learn English quickly and subconsciously, while retaining their heritage language at home. It is much harder for parents, who tend to be more isolated and whose language skills are already fully developed. Teachers realize that it is harder for these parents to help their children with homework and projects, which in turn can affect classroom performance. Joe Williams, a fourth grade teacher at Saint Michael’s, pointed out that what might be perceived as a learning issue could simply be a case of a child not getting enough help at home. Schools are finding ways to reach out to parents who may know little or no English. At OLSS, Lovallo uses an online program that allows students to read in English and Spanish. They can share the Spanish version at home to engage in meaningful discussions about schoolwork with their parents. Teachers also celebrate the universal language of food. Many schools sponsor events that encourage families to bring in dishes representative of their home countries. “We’ve got [students] asking the Latino kids ‘When’s your mom making the empanadas again?’ And we’ve got Latinos looking for the eggrolls. There’s a lot of sharing going on,” said OLSS’ Pileggi. Bishop Schad teacher Veronica Glogau believes her school community has particularly benefitted from expressions of devout faith evident in Latino families and students. Other Bishop Schad teachers said they are happy to see Latino families participating in school functions — a sign that, despite some language barriers, families feel welcome and comfortable. Most South Jersey Catholic elementary schools have madrinas or padrinos (meaning “godmother” or “godfather” in Spanish). School madrinas and padrinos connect with and support Latino families. Saint Michael’s middle school teacher Sharon Fabrizio recalled with gratitude a time when madrina Brigida Lopez provided translation support to ease communication with Latino parents. 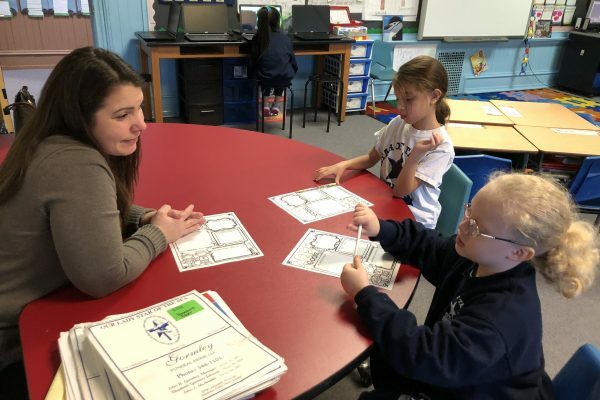 Catholic Schools Week is a celebration of the many ways South Jersey Catholic schools educate and inspire young minds spiritually, academically and in service to others. Several schools have planned events to honor and share cultural traditions in increasingly diverse communities. And there is a pretty good chance some of those celebrations will involve empanadas and eggrolls. Mary Beth Peabody is marketing and communication manager and Marianela Nunez is field consultant Latino enrollment, Office of Catholic Schools, Diocese of Camden.